« What helps you learn ? Awed by designers’ fashion drawings ? Amazed by sewers who sketch their planned wardrobes ? I thought it was impossible for me. So was delighted to discover this Christmas that there are children’s toys which help with this process. Use stencils that you draw round. Fashion Angels Design Portfolio is one. The shape you want isn’t included ? Make your own stencil. Print the line drawing from commercial pattern information, onto “printable acetate” sheet. Cut out the shape to make your own stencil. Not easy but it is possible. 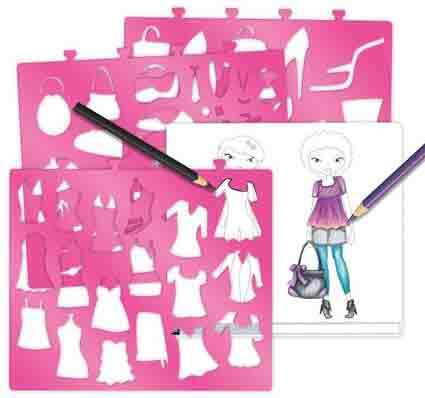 There are children’s kits which are the modern equivalent of paper dolls – use templates to cut out pieces of paper in the shape you want, add glitter and trims. Such as Paper Fashions by Klutz. Some of these kits contain fabric rather than paper. Or small 3-D mannequins which are easy to attach fabric to. Such as Designed by you fashions. These are obviously popular toys as there are multiple versions. Search ‘fashion’ in the toy section at Amazon. Good if your focus is fashion design rather than pattern making or sewing. Personally I prefer to make ‘real’ small clothes. It would be fun to have a half-scale dress form, such as one from Dress Rite. 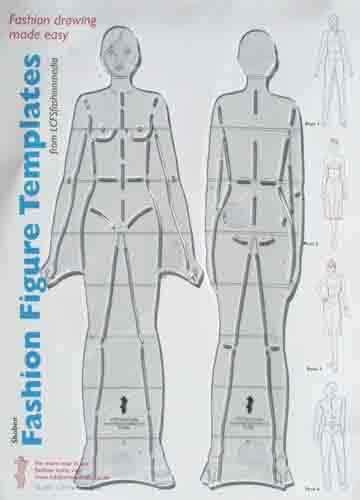 Or a quarter-scale 16 inch ‘fashion doll’ with adult body shape (not as distorted as Barbie), such as Tyler-Wentworth. Generally I can only find sources in the US, and shipping charges are huge. I’m making basic fitting shells for my 18″ child-shaped doll. So I can play with pattern making 😀 Also – like us – she’s not quite the same shape as commercial patterns for 18″ dolls. Many tips on easy drawing approaches here from Threads magazine. Fashion Design Workshop is a teen’s guide book on techniques for making your drawings look more like clothes. Lots of examples to copy. There’s a bit about fashion drawing in the middle of this video from Simplicity. From a designer so she makes it look easy. The basic figure drawing which you add your fashion drawing to is called a ‘croquis’. 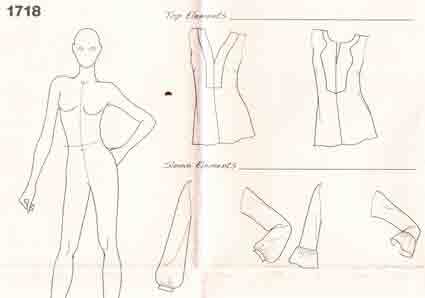 The ‘croquis kit’ in Simplicity’s Project Runway patterns includes a fashion figure, and separate drawings of each the style elements in the pattern. They suggest you trace the style elements onto separate vellum sheets, then move them over the fashion figure to choose which combination you like. Here’s part of Simplicity 1718. Of course there are many books for people who want to produce professional fashion drawings. I’m just talking about having fun/ doing something that’s personally helpful ! No good at drawing the human figure ? Many ways of avoiding this. These aren’t children’s toys, they’re proper fashion designers’ aids. Shoben Media have croquis templates to trace around. Designers use the angled poses to display their work, as they make clothes look better. But to make design details clear, or to sketch from a pattern line drawing, you need the straight standing pose. There are many sketch pads pre-printed with croquis. The Fashion Sketchpad is an example. Hmm – compare the Shoben model croquis with a croquis more like me (from a discontinued site showing Trinny & Susannah’s 12 Body Shapes). Obviously sketching clothes onto a model croquis is fun for fashion designers, but not much use in deciding if a style flatters my body shape ! Designers’ croquis have long thin body proportions (ratio of 8 or 9 heads to body), the proportions which make clothes look good. But only a very small number of people have this body shape in real life. 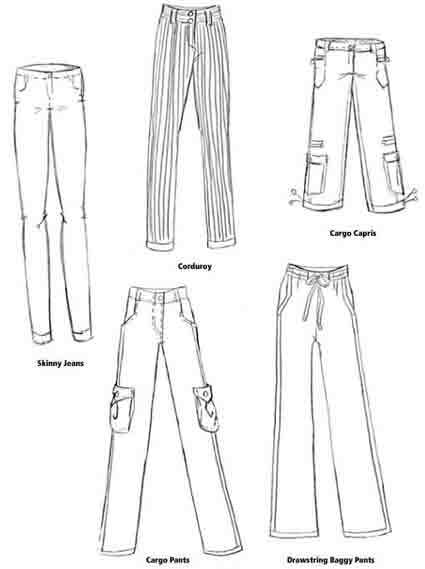 There are free croquis from Threads magazine which have more ‘average’ proportions. They include croquis for petite and plus figures. 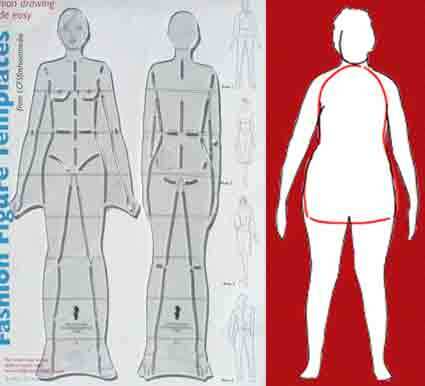 You could print a croquis on tracing paper, so you can trace pattern line drawings onto a body shape. For this, start with a straight-pose croquis like the ones above. Check your tracing vellum will work with a printer ! Some fiddling with sizes may be necessary to get figure and clothes to the same scale. Learn to use the scaling function in your printer software. . . This is just a small sample of what’s available. Some people think they can’t play with these books and kits because they’re for children. How sad. My drawing skills are definitely at childish level, and they’re just right for me. This entry was posted on February 9, 2013 at 12:07 pm and is filed under body shape, personal style. You can subscribe via RSS 2.0 feed to this post's comments. Both comments and pings are currently closed. Wow! what a nice lot of drawing aids 🙂 taking the time to sketch out ideas, especially on a croquis similar to one’s own figure, is really worth the time and effort. I’ve have more of both than $$$ as a rule over the years, and sketching is a very cheap way to investigate various styles, cuts, hem lengths, etc. Plus it’s lots of fun! I’ve made a couple of quick and dirty croquis of myself which work out fine. Just take a pic of yourself in close-fitting clothing against a contrasting background (you in black against a white wall or vice versa). Print the pic and cut out around the edges. Color the edges black (a permanent marker is best for this, you want a very very black black), then paste your croquis onto a piece of white paper. This will provide enough contrast that you can trace your outline even thru most printer paper. I have only one quibble. No one looks good in a straight-pose, in fact that is the most efficient way of making clothes and people look their worst. Additionally, no one ever stands like that in real life, so you don’t really get a good feel for how the clothes will look on you (if you’re sketching on a croquis of your body or body-type). For making croquis, I like a pose where you face the camera full-on, with shoulders and hips parallel to the flat front and back of the camera. Place your feet shoulder width apart or a little further. Put your weight on one hip and put your hand on that hip. What the heck, go the whole hog and smile! This pose will allow you to sketch in all the relevant details, etc. while giving you a more natural feel for how the clothes will look on you, in my humble opinion. Omigosh, this has to be one of the coolest posts in the wide world of style blogging! My first reaction is that even with all the aids, I would never be up to it. But if Steph adds that it’s a really great tool for her, maybe I need to tackle it. She’s so great at finding the “her-ness” elements in clothing details. I sometimes use a shortcut method of visualizing new styles on me. Whenever I see something pictured online that I like, I mentally block out the face and try to imagine just the 3D outfit on my own body. It’s usually pretty clear which ones are not for me. I must be the real Eccentric because I don’t relate to the physical stances lots of folks assume in order to post a good view of themselves and their outfits. In those cases, I can’t imagine whether it would work for me because I am the oddball who does stand straight on, weight on both feet, like to feel very grounded and ready for action. My husband used to be a bouncer and I think I most closely resemble his stance, though his arms would have been crossed and I’m more an eager-for-(positive/pleasant) activity gal. I can relax more with hands in my pockets – and just spotted a cocktail dress with this front pocket feature that I instantly loved – but I still picture myself standing straight on. The Colette Sewing book has a suggestion for drawing your own personalised croquis starting from a photo. But a much simpler option is to use your PC/laptop like a lightbox and (gently) trace your figure directly from the screen onto a piece of paper. Many thanks for all the useful easy ways of making a croquis. I’m another of the straight pose standers ! I also like a straight croquis so i can copy the pattern line drawing onto it. unaware of how they are treating their bodies. there is an unnatural counterbalance movement in your shoulders.